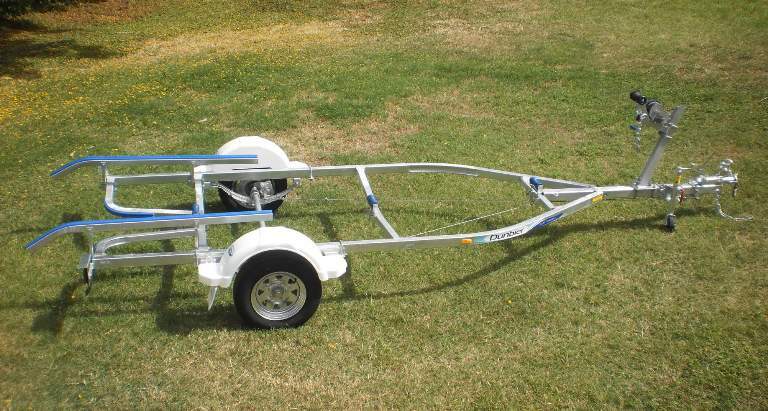 Mackay Trailers stocks five sizes of Dunbier boat trailers to suit boats to 5.3m and can supply larger sizes to order. Dunbier boat trailers are a product of Dunbier Marine, an Australian company based in Melbourne who celebrated their 45th anniversity in 2014. Previously Dunbier boat trailers were assembled in Melbourne and transported to dealers throughout Australia. To save freight and therefore to save you money Mackay Trailers now assembles 5 sizes of Dunbier Boat trailers in Mackay. Hot Dipped galvanised frame. New galvanised wheels and tyres. Led lights. Steps front and rear of mudguards. Jockey wheel included. Winch with strap. Protected lights. Galvanised axle. With Dunbier's own distribution centres Australia-wide, when buying a Dunbier you are investing in a quality made trailer that offers you after sales, service and support across Australia. Over 45 years of experience, endless hours of groundbreaking design to suit the Australian and South Pacific markets.